The third 38.4m Majesty 125 motor yacht was rolled out from her shed, ready to be launched imminently. The Majesty 125 was introduced in 2010 with the launch of Grenadines III. At that time she was the second trideck built by Gulf Craft after the launch of the Majesty 130 named De Lisle III in 2007. This series is still the second largest model produced by the Middle East yard. Gulf Craft launched Marina Wonder in 2012, the second hull of this series. In its standard version, the Majesty 125 motor yacht accommodates 10 guests in a full-beam master on the main deck and four double cabins on the lower deck. Built in composite, her semi-displacement hull is powered by twin 2,400hp MTU engines giving a top speed of 23 knots and a range of 2,000 nautical miles at 12 knots. The third Majesty 125 motor yacht is easily distinguishable from her sister ships thanks to her full-white paint job. 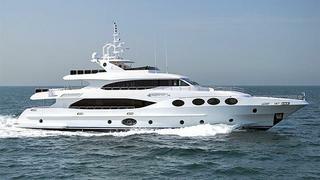 She is scheduled to make her debut at the upcoming Dubai Boat Show in March.